As many of you know, I'm in the process fo putting this information together in a 'book' of some sort. A lot of the information that has come to me recently has never been published. There include accounts from friends and musicians who've worked with Bob Dylan both in live performance and in the studio. Tentatively, we're looking at late 2012 for a publishing date. It will be titled "Skipping Reels Of Rhyme" somewhat unimaginatively. Thanks to everyone who has contributed so far - lots of interesting things!!!! In the meantime, I'm still looking for tapes, Acetates and reel-to-reel recordings...if you have any, drop me an email! 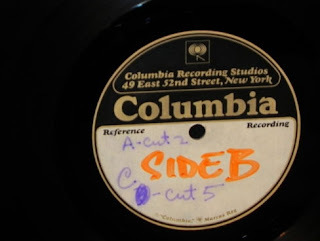 Photo of an acetate of 'Street Legal' that appeared on eBay.